In small bowl, mix 3 tablespoons sugar and the cinnamon; set aside. In medium bowl, stir Bisquick mix, hot water and remaining tablespoon of the sugar with spatula until dough forms. Spoon mixture into pastry bag fitted with 1/4-inch star tip. Pipe 5-inch strips of dough into hot oil. If necessary, cut dough with knife or scissors between each churro. Cook 2 to 3 minutes, turning frequently, until are golden brown. Carefully remove from oil; drain on paper towels. 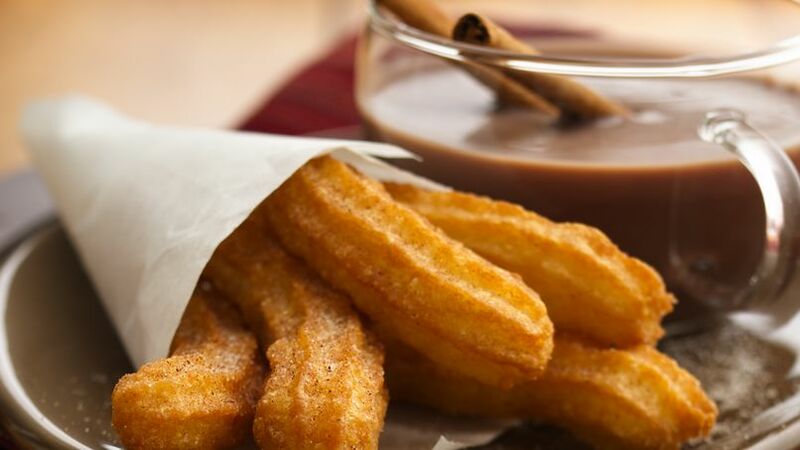 Serve churros with hot chocolate. Mix Bisquick®, 3 ingredients more and only 30 minutes; this is all you need to make this Mexican classic sprinkled with cinnamon and sugar.